It is with sadness we report that Lieutenant David Elvin RANCE of Boreham, Essex died on 20 August 2011 aged 76. David was called up for National Service in 1953 with 1 WORCS R and underwent recruit training at Norton Bks before attending Eaton Hall OCS. He was commissioned into the 1st Battalion The Worcestershire Regiment in 1955 and served with it in Bulford and Iserlohn. David completed his National Service in 1956 then went on to Oxford University until 1959 when he then joined 7th Battalion The Worcestershire Regiment. In 1963 David went to Cornell University in the USA and subsequently had a successful career as an Occupational Psychologist and Management consultant. It is with sadness we inform you that 19003519 WO2 (TQMS) Colin RAYNOR of Lincoln died on 7 August 2016 aged 88. Colin was called up as a National Serviceman into the Lincolnshire Regiment in July 1946 and transferred to 1st Battalion Sherwood Foresters in February 1947. He was discharged on completion of Service on 4 July 1948 and re-enlisted on a 5/7 engagement with The Sherwood Foresters on 5 July 1948. He completed a Guards Drill course as a Corporal in September 1948 and was a Driving Instructor 1949 – 1950 with C Coy. In December 1950 he was posted as a Sergeant PSI with the 5th Battalion Sherwood Foresters at Derby until 1954 when he was posted to Nottingham OTC as a PSI. In January 1956 Colin was attached to 1st Battalion Royal Lincolnshire Regiment for service in Malaya returning to the 1st Battalion Sherwood Foresters when it went to Malaya. In 1959 Colin was posted to the Depot at Derby as Staff Sergeant CQMS until May 1963 when he was posted as WO2 Ranges to RMCS Shrivenham. In 1966 he returned to 1st Battalion Sherwood Foresters as TQMS in Munster. He left the Regiment on 9 January 1968. His funeral is to take place on 7 September 2016 at 1350 hours at Lincoln Crematorium, Washingborough Road, Lincoln LN4 1EF. Association members and Standards welcome. It is with sadness that we notify you that 22994611 Cpl Harry REAY of Gloucester died on 4 October 2016. Harry served with 1st Battalion The Worcestershire Regiment as a National Serviceman in Bulford and Iserlohn from 1954 until 1956.
stout, rather than smart, footwear (wellies acceptable). After the service, everyone is invited back to The Rock for light refreshments however parking there is limited, so if arrangements can be made to share a car to and from The Rock, it would be to your advantage. It is with regret that we inform you that 23709937 Cpl Michael REEVES of Kirkby-in-Ashfield, Notts died on 27 January 2017 aged 77. Mick enlisted into 1st Battalion The Sherwood Foresters in June 1959 and served with it in Malaya, UK, NI, UNFICYP and BAOR. During his service Mick was a Battalion Heavyweight Boxer, Bisley Shot and also took part in Rugby, Basketball and Athletics. He left the Regiment in July 1968. The funeral is to take place at Mansfield Crematorium at 1400 hours on Thursday 16 February 2017 followed by a wake at Kingsway Bar & Grill, Kingsway, Kirkby-in-Ashfield NG17 7FN. Association representation would be most welcome. Family flowers only, but donations in memory of Mick may be made to Yorkshire Bank: Sort Code:05,-03-81, Account number: 49416894, Reference: Mick Reeves. The family aims to purchase a fold-up bed for Ward 44 to be used by families that need to spend longer periods of time with loved ones at such a sad time. conspicuous gallantry and insisted on pinning the medal ribbon to Reinhold’s dressing gown. On his return to England, Reinhold was invested with the medal by King George VI at Buckingham Palace. During the Second World War he commanded a rifle company of the 3rd Battalion Monmouthshire Regiment and was then brigade major to 130th Infantry Brigade. He was mentioned in despatches for his involvement in the 43rd Division’s planning for D-Day. Reinhold saw fierce fighting in the “breakout” from Normandy and at Arnhem. He was decorated by the Dutch after the liberation of Holland and, in December 1944, he was seconded to the 1st Battalion The Worcestershire Regiment. He was its acting CO in the forced crossing of the Rhine, the breaching of the Siegfried Line and the drive into Germany’s heartland. Col JD Reynolds MC of Worcester died on 7 Nov 2015. He enlisted in the Worcestershire Regt in 1940, volunteered for service with 3 Commando, took part in raids on the Norwegian coast before being commissioned in 1942. On return to 3 commando he served in N Africa and the Sicily landing where his platoon captured a bridge. He then landed in Italy in advance of the invasion and, despite being attacked , sent back valuable information for the invasion force for which he was awarded the MC for displaying "leadership, a disregard for danger and an excellent example". He was later wounded in Italy and on recovery rejoined 3 Commando in Normandy and took part in river crossings on the Rhine, Aller and Elbe. After the war he joined 1st Bn the Worcestershire Regt in Trieste, Pola and in Berlin during the Airlift. After the Staff College he served in Canada, then in Jamaica with the Regiment before being appointed the last Commanding Officer of the Regimental Depot at Norton, followed by a tour with the Aden Protectorate Levies. On promotion in 1962 he commanded 3 Cheshire (TA) followed by staff appointments in Hong Kong and Kuwait. In retirement he served as regimental welfare officer The memorial service for Colonel JD Reynolds MC who died on 7 November 2015 will be held in Worcester Cathedral at 1430 hours on Wednesday 9 March. Northampton, NN1 5EY Tel: 01604 635265 or donations to RESTART at Northampton General. Donations will be collected on the day of the funeral . It is with sadness that we inform you that Mrs Dorothy Ricketts, widow of Lt Col J D Ricketts DSO died in New Zealand on 19 July 2018. It is with regret that we inform you that 426990 Lt Colonel Vivian Howard RIDLEY MBE QGM of Salisbury died on 3 February 2019 aged 87. He was called up as a National Serviceman in 1950 with the F.R.R.C. before attending Eaton Hall and RMAS. Vivian was commissioned 2nd Lt on 6 February 1953 into the Wiltshire Regiment where he served as a Pl Comd in Warminster, Chester and Cyprus 1953 to 1957. He was then appointed Adjutant of Depot the Wiltshire Regt and Depot Duke of Edinburghs Royal Regt (DERR) at Devizes, 1957 to 1960 before being Seconded to the Ghana Army 1960 to 1961. He was then posted to 1 DERR and served with it in UK, Malta and Cyprus 1961 to 1963 before attending Staff College at Quetta and Camberley in 1964. He then served as a Major Exchange DAQMG HQ Canadian Armed Forces 1965 to 1966, 1DERR Coy Comd BAOR and British Honduras 1968 to 1969, DAAG MOD(A) M6 London 1970 to 1971, 2IC 1st Battalion DERR Berlin and N/Ireland 1973 to 1975, DAAG HQ Prince of Wales Div 1975 to 1976 before being posted to 3rd Battalion The Worcestershire and Sherwood Foresters as Commanding Officer 1977 to 1979. Vivian was then appointed Monitoring Officer CLAMOR in Rhodesia 17 December 1979 to 31 March 1980 before taking up the post of AAG/CRLS HQ Eastern Dist 1980 to 1982. He finished his regular service as SO2 AG2b (DAAG B AG2) MOD Stanmore 1982 to 1986. The funeral is being held on Tuesday 26th February at Salisbury Crematorium, Barrington Road, Salisbury, Wiltshire. SP1 3JB Tel: 01722 333 632. No flowers, but donations to The Rifles or RGBW. It is with regret that we notify you that 22220605 LCpl Albert Dennis RIMINGTON of Newark died on 4 March 2018 aged 90. Dennis enlisted into the Duke of Wellingtons Regiment in 1945 with number 14056902 and was discharged in 1948 on completion of service. He served in Palestine, Egypt and Sudan. In November 1948 he re-enlisted into 8th Battalion Sherwood Foresters and served with it until 1951. After leaving the Army Dennis worked with Newark Council and was a strong supporter of Newark Branch as Treasurer and Standard Bearer. His funeral is to take place on Wednesday 21 March 2018 at Christ Church, Newark at 1400 hours followed by committal at Ollerton Crematorium. Standard Bearers and Members would be welcome. For those wishing to write in condolence, his widow is Mrs Janet Rimington, 15 Pierson Street, Newark, Notts NG24 4JG. It is with regret that we inform you that 5254169 Sgt Frederick ROBINSON of Birmingham died on 16 November 2016. Fred enlisted into the The Worcestershire Regiment on 15 January 1940 and went with it to France in 1944 landing on Gold Beach at Montfleury. He saw service throughout the Normandy Campaign; at Mouen, Mont Pincon, Berjou, Vernon and on into Belgium where he was involved in Op Market Garden. He was demobbed in May 1946. Earlier in 2016 he was awarded the Chevalier de L'Ordre de la Legion d'Honneur. Prior to his enlistment he was employed as a Wire Goods Manufacturer and returned to this profession in Birmingham after the War, eventually becoming Factory Manager. His funeral is to take place on 30 November 2016 at Robin Hood Crematorium, Shirley, Solihull at 1400 hours. Standards welcome. It is with sadness we report that Mrs Mary Rochford of Upton on Severn died 24 January 2012 aged 84. Mary was the wife of Terence Rochford Worc R. A service is to be held on Mon 6 February 2012 at St Joseph’s Church, Upton on Severn at 1100 hours. t is with deep regret that we inform you that 22098548 CSgt Derek ROGAN of Newark died on 9 December 2014 aged 83. Derek was called up for National Service in 1949 and served with The Lincolnshire Regiment in Palestine. On discharge in 1950 he joined 8th Battalion The Sherwood Foresters and served until 1969. Derek was a staunch supporter of the Association and was Chairman of Newark Branch. Funeral details will be promulgated when known. It is with regret that we inform you that 14475817 Pte Arnold ROSE of New Ollerton, Nottinghamshire died on 2 September 2011 aged 83. Arnie enlisted into The Sherwood Foresters on 6 November 1945 and the joined the 2nd Battalion in Palestine before moving to Germany and the 1st Battalion. He left the Army in 1957. For those wishing to write in condolence, his son Andrew can be contacted at 47 Hallam Road, New Ollerton, Nottinghamshire NG22 9TT. It is with regret that we inform you that 24553398 Pte Glen “Rosie” T ROSE of Netherton, West Midlands died on 20 September 2018 aged 56. Glen joined The Worcestershire and Sherwood Foresters Regiment on 22 October 1980 and after training at Lichfield joined the 1st Battalion in Germany. He also saw service in NI. Whilst on exercise in Soltau, Germany in 1983, he was seriously injured in a vehicle accident and was subsequently medically discharged from the Army on 9 February 1985. His funeral will take place on Thursday 4 October at 1115 hours at Rowley Regis Crematorium, Powke Lane B65 0AD. The family would welcome friends who knew Glen during his service but have asked that no standard bearers or military uniforms be present. Family flowers only and donations to the family’s chosen charity can be given on the day. It is with sadness we inform you that 23545047 Cpl Christopher SALES of Lancaster died on 13 October 2012. Chris served with B Coy 1st Battalion The Sherwood Foresters 1958 – 1964 in Malaya and Cyprus. 30194627 PTE J L SAWYER ROYAL LOGISTIC CORPS. 30194627 Private J L Sawyer died in Cyprus on Thu 12th Mar 2015. Pte Jay Sawyer was a Royal Logistic Corps Chef attached to 2 Mercian. The soldiers of The 2nd Battalion, The Mercian Regiment Battlegroup are serving operationally with the United Nations Peacekeeping Force in Cyprus, and are based in the capital city Nicosia. While he was conducting Adventure Training in the Mediterranean Sea he was involved in a tragic and fatal canoeing accident. It is with regret that we inform you that 24298698 Sgt Stuart SCAIFE of Derby died on 22 June 2017 aged 59. Stu enlisted into 1st Battalion The Worcestershire and Sherwood Foresters Regiment in 1972 and served with it in Germany, Northern Ireland, Belize and UK before leaving the Army in October 1987.The funeral of 24298698 Sgt Stuart Scaife who died on 22 June 2017 will be held at Markeaton Crematorium in Derby on Monday 31 July 2017 at 1330 hours, thereafter a celebration of his life at the Norman Arms on Village Street in Derby. Members and Standards welcome. It is with regret that we inform you that Lt Col (Retd) Douglas Noy SCOTT of Andover died on 27 May 2012 aged 92. Duggie was commissioned into The Sherwood Foresters in March 1939 and served with the 2nd Battalion in France and Belgium. After evacuation he served at the Home Service Depot with the 10th and 15th Battalions before moving to India and being appointed as GSO3 Control Officers, India/Burma/Raiding Forces. In 1945 he served as Adjt with the 1st Bn The Buffs before returning to the 1st Battalion The Sherwood Foresters in Goslar, Germany in 1948. From 1949 -51 he served with GHQ FARELF before being posted to 2nd Battalion The Sherwood Foresters in 1952. He then attended Staff College in 1953 before moving to GHQ MELF where he served until 1956 before returning to take up the post of Training Major at Normanton Barracks. He then went with 1st Battalion The Sherwood Foresters to Malaya until 1960 when he moved to Nottingham University as Training Major. His last posting before retirement in 1969 was as SO1 (PT) HQ BAOR. It is with sadness that we inform you that 4977025 Sgt George C SCOTT of Keyworth, Nottingham died on 2 February 2014 aged 94. George enlisted into the 2nd/5th Battalion The Sherwood Foresters and served with it in France with the BEF and later in North Africa, Italy, Greece and Austria before being demobbed in March 1946. After the war he became very involved with the Royal British Legion and was a former President of the Colston Basset, Owthorpe and Cotgrave Branch. His funeral is to take place at Wilford Hill Crematorium, Nottingham on Monday 17 February 2014 at 1120 hours. The family would appreciate it if Standards could be present. It is with sadness that we inform you that 23980427 LCpl Colin Peter SEYMOUR died on 21 December 2017 aged 71 yrs. Colin enlisted into 1st Battalion The Sherwood Foresters in 1964 continuing in the Worcestershire and Sherwood Foresters Regiment until his discharge in 1977. His Funeral is to take place at St Mary’s Church, Manor Court Road, Nuneaton, CV11 5HU at 1445 hrs on Thursday 18 January 2018, followed by a private Cremation. Mourners are asked to be seated in the Church by 1415 hrs. Photos of Colin during his Army career will be appreciated by the family. Messages of Condolence may be sent to his Grandson, James Williams, 244 Heath End Road, Nuneaton, CV10 7JB. Standard Bearers and Association members are invited to attend. It is with sadness we notify you that 23674329 Pte Thomas Harry SHIELDS of Sutton in Ashfield died on 15 December 2016. Thomas was a National Serviceman and served with A Coy, 1st Battalion The Sherwood Foresters in Malaya. Funeral details will be notified when known. It is with regret that we notify you that 23946789 LCpl Eric 'Danny' SHOOTER of Nottingham died on 26 October 2018. Danny enlisted into 5th/8th Battalion Sherwood Foresters in 1962 and when it was disbanded in 1967 he continued serving with D (Sherwood Foresters) Coy Mercian Volunteers. His funeral has taken place. It is with sadness we inform you that Mrs Eileen Shrimpton wife of ex WO2 (CSM) Charlie Shrimpton (1 WORC R) died on 8 January 2013 aged 83. It is with sadness that we inform you that In-pensioner 21012363 WOI Charles Edward SHRIMPTON of Royal Hospital Chelsea died on 21 November 2018 aged 91. Charles joined the RA as a junior soldier on 10 June 1942 until 08 June 1945 and then in adult service from 9 Jun 1945 until 1 Jul 1947. He joined the Worcestershire Regiment on 28 Nov 1947. From his earliest Regimental days he upheld the fine shooting reputation, first established by his father Major C E Shrimpton and was a prominent member of the 1st Battalion Shooting Team which won the KRRC Trophy at Bisley in 1955. He spent most of his service with the 1stBattalion where he rose through the ranks and was awarded the GSM Malaya and LSGC. In January 1962 he was promoted to WOI and appointed RSM of the 7thBattalion (TA). His last year of Colour Service was with the Mercian Brigade Depot at Lichfield prior to discharge on 31 Mar 1968. Charles was admitted to the Royal Hospital Chelsea in November 2015. His funeral service will take place in the RHC Chapel on Monday 10 December at 1400 hours. All are invited to attend. It is with sadness we report that 22596257 Pte Arthur SLATER of Halesowen, West Midlands died on 12 August 2011 aged 78. Arthur served with 1st Battalion The Worcestershire Regiment as a National Serviceman from 1951 to 1953 in Support company in Malaya. For those wishing to write in condolence his wife, Margaret can be contacted at 67 Dunstall Road, Halesowen, West Midlands B63 1BD. A Service of Thanksgiving for the life of Brig B Smalley will be held in the Choir of York Minster at 1400 hours on Tuesday13 March 2018. For those who wish the wearing of medals would be considered appropriate. It is also anticipated that a gathering post service will also take place but details of a venue are still being clarified. It is with regret we inform you that 19036429 Pte Bernard Lewis SMITH of Nottingham died on 21 September 2016 aged 87. Bernard was called up as a National Serviceman in November 1946 and after training was posted to the Sherwood Foresters in February 1947. In 1950 he was posted as a reinforcement to serve in Korea. His funeral is to take place at Bramcote Crematorium, Coventry Lane, Bramcote NG9 3GJ on Saturday 15 October 2016 at 1530 hours. Standards welcome. It is with regret we inform you that 22397934 Pte Frank SMITH of Stoke on Trent died on 8 August 2012 aged 83. Frank served with 1 Worc R HQ Coy Signals Pl in Malaya in 1952. It is with regret that we inform you that 23451144 Cpl Maurice SMITH of Alfreton, Derbyshire died on 5 July 2014 aged 77. Maurice was called up as a National Serviceman into The Sherwood Foresters on 6 February 1958 and served with 5 Pl B Coy. He served in Malaya and was engaged in operations Badak, Ginger and Saddleup. He completed his service on 4 February 1960. Funeral details will be promulgated when known. It is with regret that we inform you that Captain Douglas James SNOXHILL of Godalming, Surrey died on 18 May 2013 aged 90. Douglas was called up in 1941 and after training at Norton Barracks attended Sandhurst before being commissioned into The Worcestershire Regiment and joining 11 Worc R in November. In 1944 he was posted as an instructor at the Infantry NCO School until joining 9 Worc R. He transferred to A Coy 1 Worc R in July 1945 and served in BAOR and Trieste until his release in November 1946. It is with sadness we inform you that 248378 Padre Capt William SPEIRS of Melrose , Scotland died on 13 June 2013 aged 96. Capt Speirs served with 1st Battalion The Worcestershire Regiment in WW2 and took part in the battles for Hill 112 and the Falaise Gap where he was wounded. It is with regret that we notify you that 22843180 WO1 (RSM) Paul SPELMAN died on 15 January 2017. 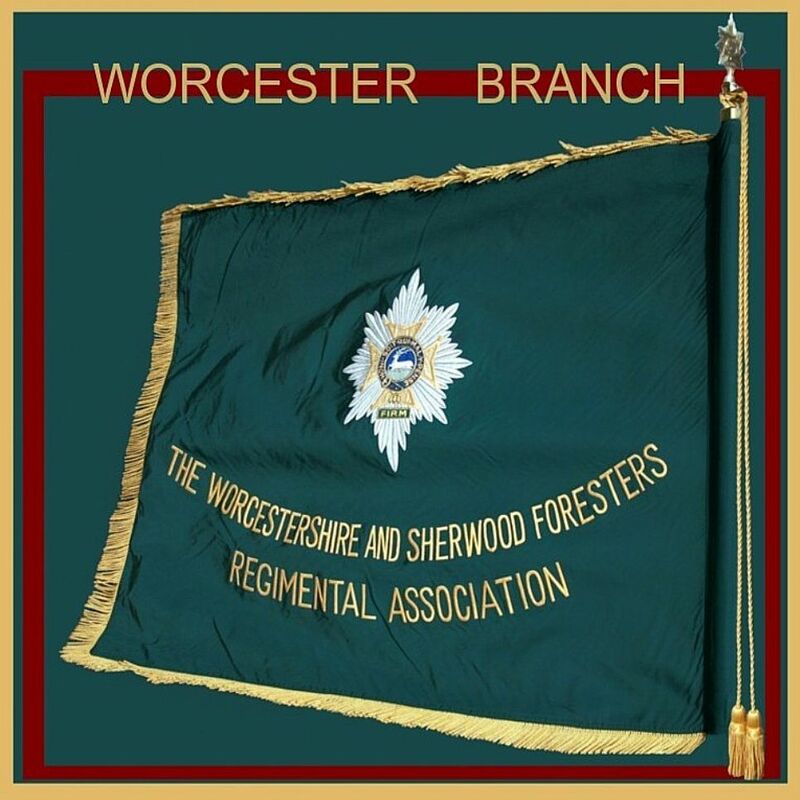 Paul enlisted into 1st Battalion The Worcestershire Regiment and continued to serve with 1st Battalion the Worcestershire and Sherwood Forsters Regiment after the amalgamation. He left the Regiment in April 1977. Funeral details will be promulgated when known. It is with regret that we inform you that 2nd Lt Adrian Timothy James STANFORD of Westminster, London died on 3 May 2016. Adrian served in the ranks as a National Serviceman with the Rifle Brigade in 1954 before moving to Eaton Hall as an Officer Cadet. He was commissioned into 1st Battalion The Sherwood Foresters and joined it in Derna Cyrenacia (Libya) in September 1954. Adrian was then appointed Assistant Adjutant at Chiseldon, Wiltshire in September 1955. On leaving the Army he went up to Merton College, Oxford before commencing a banking career in the City of London. His funeral is to take place in the Church of Saints Peter and Paul, Preston Capes, Northamptonshire on Monday 6 June 2016 at 1130 hours. It is with regret we report that 4986533 Cpl Eric STONE of Ilkeston died on 7 February 2012 aged 90. Eric enlisted in 1940 and served with The Sherwood Foresters in Malta, North Africa and Italy. It is with sadness we inform you that 412078 Maj Robert Basil SULLIVAN-TAILYOUR of Sutton Veny, Warminster died on 24 February 2015 aged 84. Robert attended Eaton Hall OCS and Mons OCS in 1948 before being commissioned into the Sherwood Foresters in 1950. He joined the 1st Battalion in BAOR and in 1952 was appointed Pl Comd of Anti Tank Platoon in Egypt before being posted to the Depot in 1953. He went on to serve with the Kings African Rifles as OC HQ Coy in East Africa in 1955. He then became an instructor at Mons OCS before returning to the 1st Battalion in Malaya in 1960. Between 1963 - 1966 he was a student at the German Staff College before returning to the 1st Battalion as a Coy Comd. In 1968 he was posted to HQ BAOR as GSO 2 before being appointed 2IC 1st Battalion The Worcestershire and Sherwood Foresters Regiment in 1970. Robert then had various Staff Appointments before leaving the Army in 1978. There will be a private family funeral and a Service is to be held in Sutton Veny in April, details of which will be notified when known. It is with regret that we inform you that Reg Strauther, President of Mansfield Branch WFRA died on 9 February 2018. The funeral is on 5 March at 1100 hours at the Methodist Bethel Chapel, Nottingham Road, Mansfield followed by cremation at the Mansfield Crematorium at 1215 hours.